When you will buy used kimono, there is a problem of sizes. Larger kimono can be nicely worn by hiding extra parts. However, smaller kimono is difficult to cover up even with some techniques. Used kimono is made by the size of people of old, so most of case, it is small. First, you will need to check Yukitake. It is a length from the center of back to your wrist. The best yukitake is either almost same length or 1-2cm shorter. 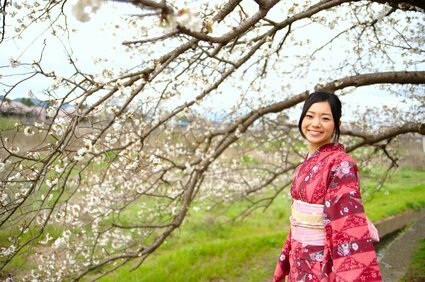 It is difficult to adjust, so it’s the most important part of wearing kimono. Next, check the Mitake. Mitake is a length of kimono. The same as your height or 10cm longer would be fine. Longer length can be adjusted, but if it’s too short, it’s hard to wear and the worst case, your legs will be shown. Other parts are relatively made with Mitake, so if your weight is not too heavy or light it shouldn’t be a problem.